Including facts about both natural and man-made poisons, from foxgloves and hemlock to rat-killer and lead paints, this book also contains many tales of murder, intrigue and accidental death. Here, you can read about toxic wallpaper that killed even bedbugs, find out why Bath bun... read full description below. Packed with facts about both natural and man-made poisons, from foxgloves and hemlock to rat-killer and lead paints, this book also contains many tales of murder, intrigue and accidental death. Pssst! It's true! This is the best book on poisons you'll ever read. Did you realise that you take poison at least once a day? There's cyanide in apple pips and harm in herbs, not to mention food preservatives, art supplies, fabric dyes and treatments once used for skin care and headlice. In this book, you: read about toxic wallpaper that killed even bedbugs; find out why Bath buns were bad for bun buyers and how poison might cure cancer; and bone up on murder mysteries, including the one about glow-in-the-dark soup. Treat your friends to toxic tales and poisonous plots! 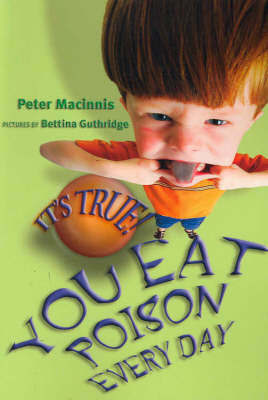 Peter Macinnis has been involved in bringing science to the general public for many years. Formerly a science teacher, he has written a number of school textbooks and science readers, and writes for a number of magazines for adults and children. He left teaching and worked first at Sydney's Powerhouse Museum and later at the Australian Museum, before returning to teaching once more, combined with part-time writing. Over the years, he has recorded many talks for radio programs developed by the ABC Science Unit. He is now a full-time writer for adults and children. Peter has dozens of ideas for more It's True! books, including one about camels and one on disgusting food.